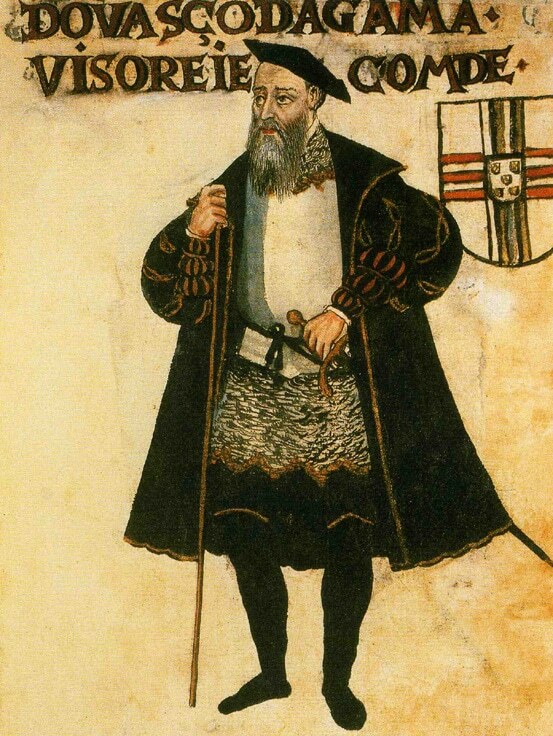 Luís Vaz de Camões was born in 1524 or 25, son of a ship’s captain who drowned off of Goa. He lived in Lisbon on the fringes of court writing poetry and plays, legend has it he fell in love with Catarine de Ataide (who married Vasco da Gama, the subject of the Lusiad just as she was the subject of Camões’s sonnets). Exiled from the court, he joined the garrison in Ceuta (Morrocco) as a common solider, and it was there he lost his eye. He is always shown thus. Between 1553-56 he sailed to India, took part in expeditions along the Malabar coast of India, in the Red Sea, along the African and Arabian coasts, visits Malacca and the Moluccas. In 1559 he was recalled to Goa, wrecked in the Mekong river where he lost everything but, legend tells us, the cantos of the Lusiads. He spent time in jail related to his post in Macau. Jailed again for debt. 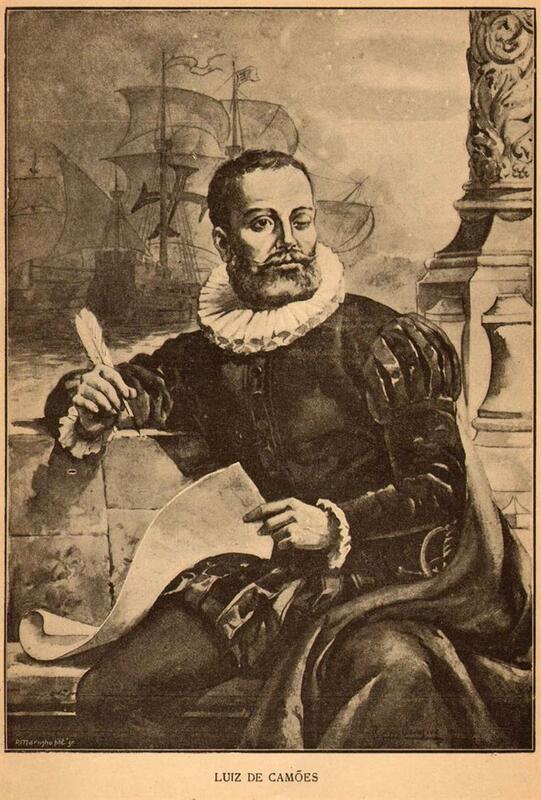 He kicks around until friends offer him passage back to Lisbon in 1570, and it is in 1572 the Lusiads are published. It is only then that ‘Camões [was] granted tiny royal pension for “the adequacy of the book he wrote on Indian matters (xxvi).”‘ It is not, I don’t think, what you might call a happy life. The whole of Os Lusiadas in Portuguese can be found here. It is written in a style heroic, celebrating the bravery and brutality of Vasco da Gama and his sailors. There is a strange invocation of Roman Gods and nymphs, an evocation of Empire that sits easier with the Portuguese project than Christianity — it seems obvious perhaps, yet I found it strange and fascinating both that the whole of it is couched in terms of Jupiter’s support of the Portuguese cause, Bacchus’s dissent and constant meddling. From the equator to the midnight sun. Fate absolves them of everything and I love that they expect the hand of friendship wherever they go, despite their plan of conquest. This is at once a constant complaint of the lack of trust among strangers and a victorious poem of war against all unbelievers. Hilarious. Reminded me of Hugh Makesela singing ‘Vasco da Gama, he was no friend of mine‘ in Colonial Man. The other side to this whole poem, and the side to be on. But we continue. In which they send prisoners out to reconnoiter — I’m not entirely sure of the wisdom of this, but I suppose they weren’t just going to run away? There seems to have been a choice among prisoners as well. Ah, the jolly life of the sea. Os Cristãos, que só tanto ver desejam. Venus worries for them, she intercedes with Jove, he lists the many victories they will have (there are many such stomach-turning lists). Serão dadas na terra leis milhores. By the triumphs of her conquerors. Cos triunfos da gente vencedora. Que cuidar de fazer aos vossos guerra. In which da Gama gives a brief history of Portugal, ‘noble Iberia, The head, as it were, of all Europe’ (17: 51) to a Muslim Sultan. That doesn’t stop him from insulting the moors often and deeply of course, though he mentions that among them were Amazons (44:56). That’s cool. In this mountain which you behold. Were a great wonder to them all. Que vês, seu nascimento tem primeiro. Que a todos foram grande admiração. A buscar novos climas, novos ares. They asked for it you see. You exact on sou;s that pursue you! To drag this kingdom and tehse people? Will you guide them to infallibly? What fame do you promise them? What stories? Desta vaidade a quem chamamos Fama! Cũa aura popular, que honra se chama! D’ ouro, que lhe farás tão facilmente? Nas ondas vela pôs em seco lenho! And they just sail away as he speaks. But I wondered if that were not perhaps exactly what Camões himself thought, maybe that is the heart of this epic poem, this old man railing against violence and pride. Against the colonial project. There are echoes of this throughout. A river never seen by the ancients. At the constellations of the north. Rio pelo antigos nunca visto. Onde o meio do Mundo é limitado. This…oh man, there is so much in here isn’t there. The view of the other, the incomparable arrogance, the initimitable violence, the begginings of this trade in beads and baubles founded on a lack of respect for a culture that cares not for forks or gold. Of honey from the wild bees in the forest. Who seemed wilder than Polyphemus. Nothing stirred in the brute the least excitement. That these had made him very happy. Small as it was, to his nearby village. Hoping for what their friend had obtained. De mel os doces favos na montanha. Que com isto se alegra grandemente. Pera a povoação, que perto tinha. As peças vêm buscar que estoutro leva. They continue on, still on. And then the Cape of Storms rises up embodied before them, grotesque, and again all the contradictions in this colonial project come rising to the surface with him. The spirit describes the Portuguese need to atone for ‘his bloody crimes, the massacre | Of Kilwa, the leveling of Mombasa (45:107). Unexpected. These are celebrated later on but only after this first mention, the cost of what they are doing, its criminal aspect. The more I look at the poem the more I am intrigued by this very slender thread of self-knowledge of crimes inflicted against man and earth. The biggest lonbster-shell you ever saw. Que nunca brando pêntem conheceram. Os negros mexilhões, que ali se geram. Ũa mui grande casca de lagosta. They are becalmed, and the strangest tale told of Magrico, in which John of Gaunt who has been allied with King Joao summons twelve Portuguese knights to represent the ladies in a joust for their honour and the knights win of course…I suppose it is just to tie Portugal closer to their English allies, but so curious. Canto 7 — A last listing of Portuguese possessions after an excoriation of the infighting between Christians — the Reformation I imagination, he is particularly upset at the Germans. Canto 8, the treachery of the Muslims. Chapter 9 finally they head home, with reflections on all they had won — lands mapped, men and spices pillaged and plundered. With proofs on board of the India he had found. Certos sinais levando do que achara. And then Venus, who owns many of these islands, prepares one for these heroes. She fills it with nymphs who are theirs for the taking. De contentar a quem se afeiçoarem. Que vêm por cima da água Neptunina. Honours, which make our lives sublime. It makes me feel sick really, this treating as parable what these European sailors in reality took as divine right and with violence wherever they landed. A reminder that in it all, it is the women who are always promised as plunder. And then she bids Portugal look West, not just East. Don’t, you say. Don’t. But of course they did. This is the monument in Belem that marks where all of these conquerors set out with their swords. Hardly surprising it was built under the dictator Salazar, and rises above a great cartographic rose given them by the apartheid state of South Africa.